Rate this fascinating wunderkind of a book at least 15 on a 10 point scale! Tale's narrative stretched my brain across a few billion years of earth’s biological history. And the large volume is almost never dry, but is endlessly fascinating with many biological details from underwater air-breathing spiders (the diving bell spider) to strange plants to the mystifying arrival of human consciousness. 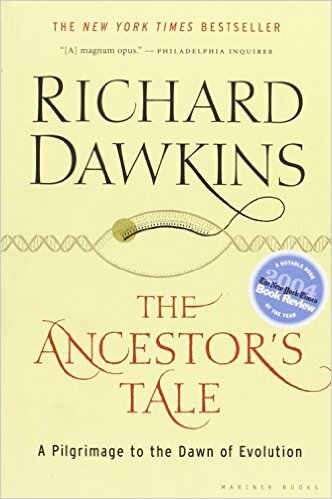 It took me a long while to finish this opus, and sometimes Dawkins left me behind, my brains confused by the more technical parts of biology. But then in those difficult sections he often seems aware of this and so gives powerful, sometimes, humorous metaphors and description to help us non-scientists out. In the field of evolutionary biology, Dawkins is ever so creative and playful when discussing complex difficult topics. I especially like his use of the Canterbury/Chaucer literary motif to ground his epic story of Life’s evolution. He’s the kind of professor/writer whose presentations induce students to fall in love with a subject. The book raises theological, spiritual, and philosophical questions minus any superficial harangues, (unfortunately characteristic of his anti-religious book, The God Delusion). When it comes to biology and evolution, Richard Dawkins is a scholar and expert—his writing deep, brilliant, and lucid. 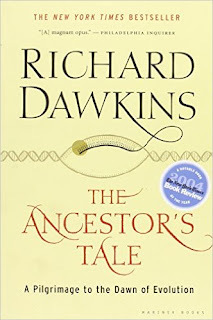 The Ancestor's Tale vastly expanded my knowledge and understanding of Life, evolution, biology and all its many forms. Now if I could only find a scholar who speaks so clearly, humorously, vividly, knowledgeably about meta issues. Well, there is one powerful contender—Keith Ward, former professor at Oxford. He is the author of God: A Guide for the Perplexed, an amazing book on the history of religion, transcendence, theology, philosophy, ethics, spirituality and more! And to a lesser degree Hans Kung, the German Roman Catholic theologian who wrote the opus Does God Exist, a 2,000 year journey through human philosophy. But because of Kung's dry convoluted prose, his tome lacks the clarity and lucidity a truly great book needs. Lastly, with a huge truckload of caution, readers may want to consider David Bentley Hart, an Eastern Orthodox theologian and philosopher, but while Hart writes well on Christian history and thought, he seems to obsess on maligning and belittling those with whom he disagrees. Anybody else read The Ancestor’s Tale recently? "To be hopeful in bad times is not just foolishly romantic. It is based on the fact that human history is a history not only of cruelty, but also of compassion, sacrifice, courage, kindness… And if we do act, in however small a way, we don’t have to wait for some grand utopian future. The future is an infinite succession of presents, and to live now as we think human beings should live, in defiance of all that is bad around us, is itself a marvelous victory." began hundreds of thousands of years before in humankind! coral lives atop all the accomplishments of millions of coral who lived before it. 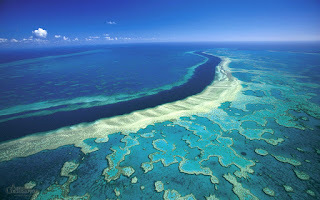 The Great Barrier Reef is the largest structure made by living organisms. It can even be seen from outer space. dating back through the centuries and millennia, back to the dawn of time. To temporarily change analogies, as kids growing up in southeastern Nebraska, we didn’t have to reinvent the wheel in order to play with our movable toys. We came to consciousness of wheels as a given, their having been invented over 7,000 years before. Some time way back in the past, when human consciousness reached a certain state of being/becoming, such basic moral laws came into conscience, became an ought for everyone. (Exactly how humans came to moral consciousness doesn’t concern us here—that’s a whole other article. Nor do the many aberrations in human history--when immoral individuals, dysfunctional families, and twisted societies distort, even try and reverse the basic moral code). When we reach an age of moral awareness, the new sense of “ought” comes to us based upon thousands of years of human history. Many thinkers posit this happens to children about the age of 7, give or take a year or 2. Very small children, of course, respond to admonishments when it comes to sharing, not harming, etc., but they probably don’t have a strong enough sense of personal “I” within a social group to consciously sense the “ought” as a universal moral code. Instead, they are mainly seeking to please their parents who care for and protect them. By the time I was 11, my strong sense of the ethical rules, not only led me to ask forgiveness and to consciously change wrong behavior, it also led to an acute awareness of how the “moral reef” I found myself on was, strangely and incoherently, at times inconsistent, and sometimes contradictory. Huge gaps existed, dangerous abysses. For instance, at that young age, I was shocked and morally repulsed when our Sunday School teacher said God had sent bears to attack some kids who had teased the prophet Elisha for having a bald head! How wrong! Why would the Bible say God would do such an unfair, harmful act? Then 2 or 3 years later I struggled with the Bible's promotion of slavery. How could the Bible—one source from which we got our moral views--condone and insist on slavery as a worthy institution!? How could Scripture in many places, (and Christians later in history and now), justify lying, stealing, killing? Why did nearly all Christians, Jews, Muslims agree with this biblical view for hundreds of years? Later still I came upon verses such as this in the Psalms: "How blessed will be the one who seizes and dashes your little ones against the rock." (Psalm 137:9). From then on my conscience--sitting atop that great moral reef of humankind--struggled to understand the contradictions I saw in Scripture and in Christians and others. Aren’t these clear contradictions chasmic ‘defaults’ in our moral reef? Not so argue Christian/Islamic/Jewish/Hindu-New Age/Nontheistic thinkers. Most Atheists claim that ethics are "subjective," "relative," "personal/cultural preferences" which change from time to time, and culture to culture. They are only a human construct, not real. So sometimes acts considered immoral, or even evil are necessary to protect the moral code and civilization itself. For example, they agree with the British leader Winston Churchill who stated, "In wartime, truth is so precious that she should always be attended by a bodyguard of lies." While other nations--our enemies--ought to be condemned for acts of torture and the slaughter of civilians, if we choose to torture or kill civilians that isn't wrong but is good. What counts is our survival. Many Christians argue from a nominalist philosophical view--the Divine Command view of ethics and Ultimate Reality. Not lying, not stealing, not harming—such demanding ethical rules aren’t eternally true. Rather, whatever God wills/decides is what is true for humans. God is free to change the moral code anytime he sees fit to do so. If anyone doubts this, who does does the individual think God is?! In other words for most Christians (Augustinians, Reformed, etc. ), God doesn't have an innate eternal ethical center/essence, but is totally sovereign, totally eternal "will." Muslims think Allah wills/ordains every good and every evil and causes all horrific natural disasters. One instance of this denial of objective, universal ethics came from our Christian youth leader at a Bible study when I was 17. He tried to convince us, based on stories in the Old Testament, that sometimes God will order us to commit immoral acts. Then he told me personally that God would call me to do what appears to be immoral! According to such Christian leaders, God does as he pleases and does what will bring him the most glory. They then proceed to give examples of how God led "his people" to lie, steal, and kill in Scripture, despite the fact that these were prohibited in the 10 Commandments. How can we human make sense of this reef madness;-)? Is the great barrier reef of the moral code unreliable, relative, temporary, changeable? Do the reverses which occurred during the immoral actions of the 20th century and the first decade of the 21st show that ethics are subjective preferences no different than whether or not a person/society likes or dislikes the color red? Was the Chinese practice of binding little girls' feet for a thousand years only a cultural/social preference? Is the ritual of female mutilation in Islamic countries a valid religious practice? At least 90% of Egyptians until recently supported female mutilation! What’s your thoughts on this difficult issue? Is the moral code reef of homo sapiens a subjective construct or as real as the Great Barrier Reef?